This kid. I asked her to scooter around the sidewalk area while I walked the dog and instead, she takes off down the grass hill. This shot was taken before she did it. I can almost see her wondering if I’d approve. I was fine with it because the space is used for dogs, bootcamp and then some, but also because she’s become quite an expert at maneuvering her Micro Maxi scooter on bumpy sidewalks, along beach boardwalks and around other far-flung places because we often keep it in the car. I’m here to tell you that a kick scooter makes a perfect holiday gift for kids ages 18 months and older. It’s fun, plus riding a scooter hones gross and fine motor skills that are useful for learning, sports, and other life skills. Think about what it takes for you to ride a kick scooter. Then, consider the following. Scooters are powered first by a kick but directed using balance. Scooters can help improve coordination with use at any age, but particularly when kids are young and learning how to balance using their weight. Developing gross and fine motor skills enables kids to become more independent while opening doors to exploration, creativity, and learning. Parents Magazine surveyed a number of experts for an article regarding why motor skills are so important for kids to cultivate early. Scooter help develop both sets of motor skills kids need in everyday life. Scooters must be transported to a place of play (often by the kids), perhaps assembled (if traveling with your kick scooter), maneuvered properly, and can even be used as a centerpiece for imaginary play… or barreling down a grass hill. The above benefits are also essential pre-reading skills for very young kids. Our books are printed from left to right so experts believe its important for new readers to be familiar with the concept of direction at an early age. Motor skills are essential for a number of other reasons. Kids not only need to hold the books and flip pages, but a good pencil grip later enables them to write words down in order to remember them better. They’ll hone motor skills to brush teeth, type and a number of other things throughout their lives. It usually doesn’t take long for kids to master riding a kick scooter. When they do, the confidence knowing they can handle it can potentially make them eager to tackle other skills. 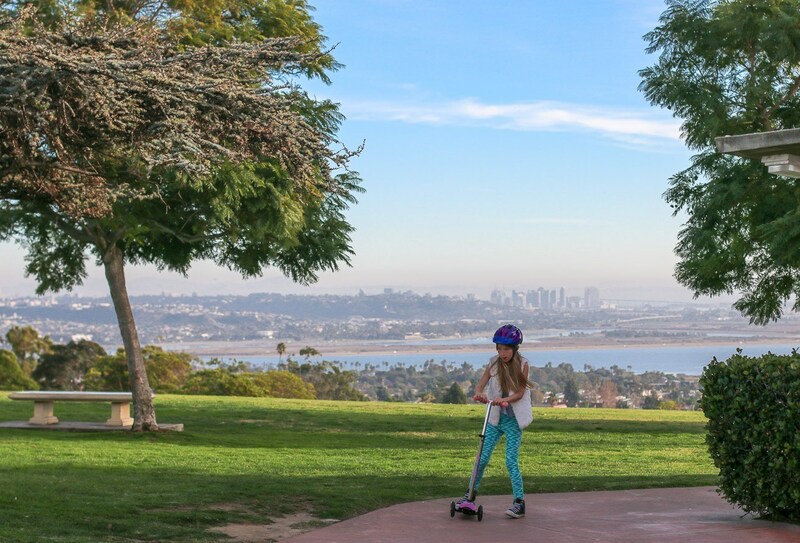 A helmet is required by California law for non-motorized scooters, skateboards, and bikes for anyone who is under the age of 18. Through riding scooters, kids can understand a bit more about the importance of protecting their bodies and consequences of not doing so. Seriously, kids love the freedom and ease that riding a scooter provides. The bottom line is that kick scooters are fun and also let them ride when walking might be a burden. The question now is, “Which scooter do I buy?” Am I right? Fortunately, Micro Kickboard has you covered from age 18 months all the way through adulthood. 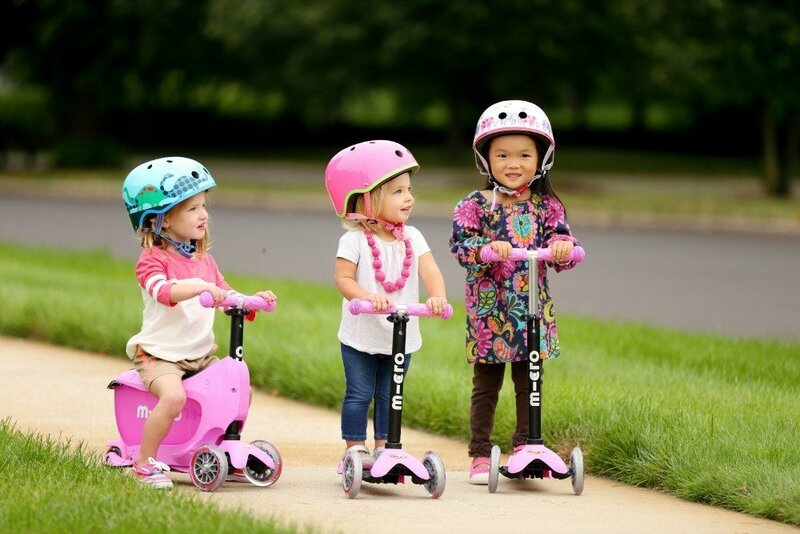 The Mini2Go (pictured above on the left) is an awesome choice for ages 18 months – 3 years because it starts off as a ride-on scooter and then converts to a stand-up scooter with a T-bar. It also has a removable toy drawer and non-marking wheels that won’t destroy floors should the kids learn to ride indoors first. The Micro Mini is the highest-rated scooter for 3-5-year-olds. Kids will learn to steer and the non-marking wheels won’t destroy floors should they learn to ride indoors. The scooter’s three wheels and low deck provide stability. It is also reasonably priced at $79.99. My daughter uses her Micro Maxi constantly. 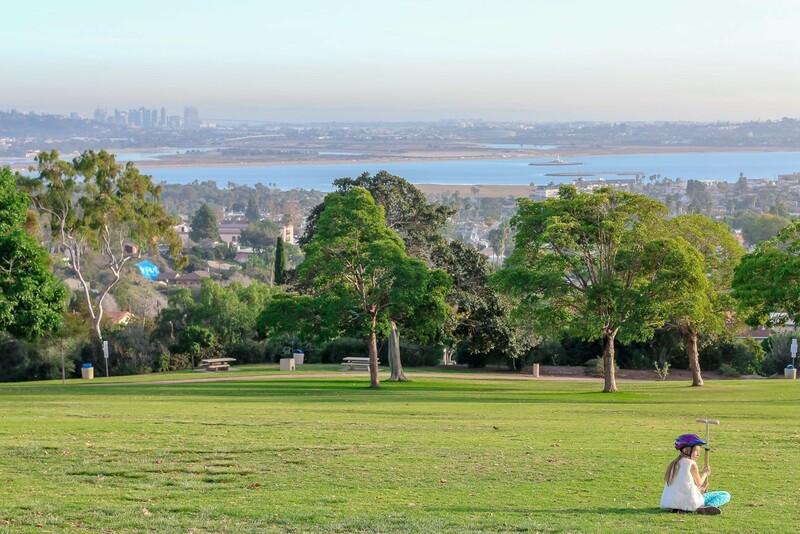 She rides it when we walk the dog together as we do at Kate SessionsParkk in San Diego (pictured above). We take it to our local beach boardwalks and sometimes leave it in the car because I never know where we’ll wind up. It is best for kids ages 5 – 12 and the highest rated for this age group. Kids can carve up the sidewalk like a skateboard with the scooter’s curving and carving action that is controlled by body weight. The Micro White and Micro Black scooters are the same adult scooter in different colors. I have a Micro White that is incredibly convenient as I can ride alongside my daughter when transporting her from our house to a neighbors and then some. It’s ergonomically-designed with a higher T-bar so that adults can maintain a comfortable stance. The oversized wheels can handle bumps in the sidewalk well and provide a smooth ride. I love it. I wasn’t sure why I’d “need” a scooter but I can tell you that I use it much more than I thought! You heard it. I’m giving away four Micro Kickboard scooters… one of each style mentioned above. The winners will be able to choose scooter color based on availability. Enter the giveaway using the widget below. I will select one winner for each scooter which means that you may not win the scooter of your choice. You may always decline the scooter and I will select a new winner… no problem. This giveaway is open to residents of the United States who are ages 18 and above. There is no purchase necessary to win and the giveaway is void where prohibited. Good luck! 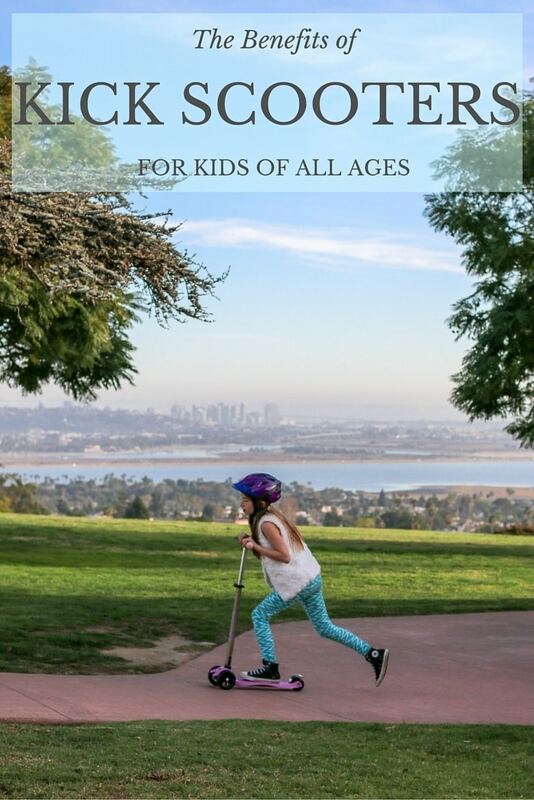 How have your kids benefitted from owning a kick scooter? my son will love to ride a scooter!!! I like the Micro Black scooter and it would be ideal for my teen daughter to have fun around the neighborhood. My daughter saved up enough money to buy her own scooter a couple years ago and now my son wants one! 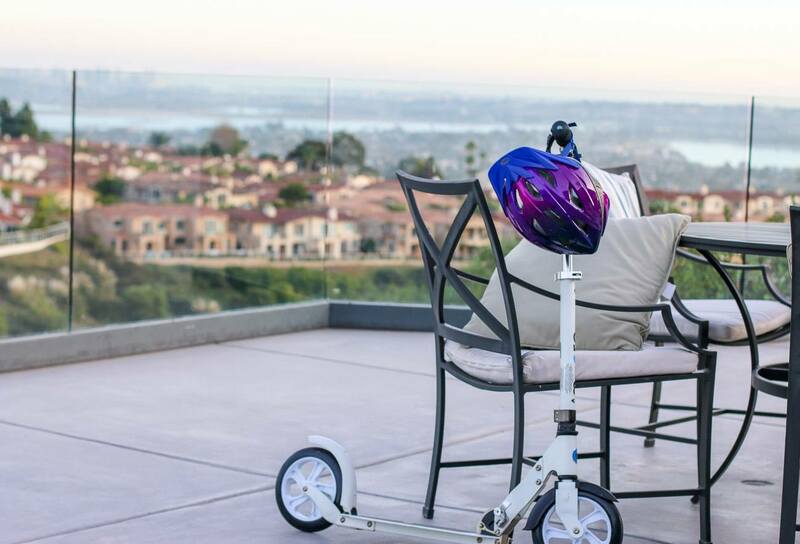 This is the first time I’m reading about the Mini2Go and it’s genius – I know my younger daughter will want to keep up with her big sister on her scooter as soon as she possibly can and I’d love to try it out with our family. the Adult micro would be for my son..hes gotten quite a bit tall lately.. hey whered my lill guy go? hes growing up.. The mini2go would be perfect for mt little beginner! 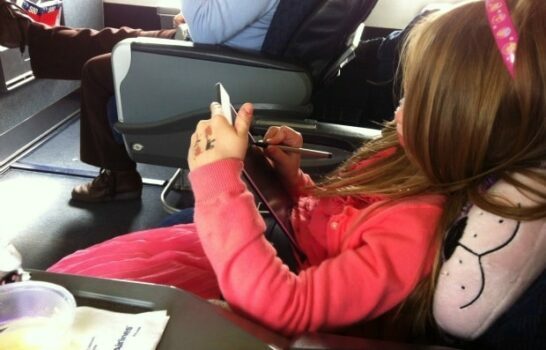 I would love the micro mini formy 6 yr old daughter. She would love it because she doesn’t have one. She does love her 3 wheel scooter but is too big for it:). Thanks for the chance! I would love to win the Micro Black adult scooter for my niece to use to have fun around the neighborhood. The Micro Maxi would be perfect for my son! He’s right at the bottom of the age recommendation for it, but that only means he’ll have plenty of use with it as he gets older. I would love to win the Micro White My son learn to ride one when he was young and still loves them as a teen! I would love any of them as I have grandchildren that are age and size appropriate for them. But especially the Micro Black scooter for my 10 year old. Thy recently moved from their old neighborhood and he would be able to get out and explore the new one and make friends. would make the perfect christmas present for my nephew! 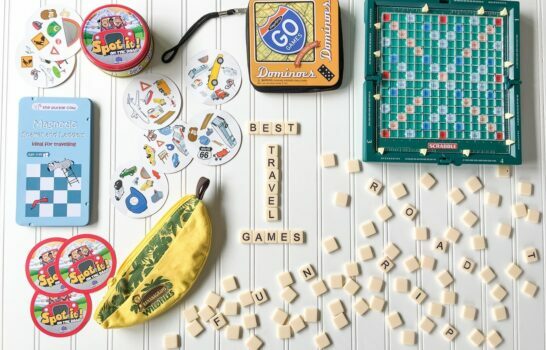 I would love to win the Micro Maxi because it’d make a great gift for my niece. I’d love the Mini 3-5 years cause my daughter would be the happiest girl with one of these to learn how to ride a scooter. I also love that it spans that age enough for her to enjoy it for quite some time. The mini bundle is fabulous! It brings everything my son would need to enjoy this ride outdoors in a safe manner. My daughter would love the Mini2Go! Thanks for the chance to win. The Micro Max would be perfect for my niece. She loves riding her scooter around the neighborhood and I know she would love a new one. I absolutely love that the your scooters are made for each age group, I know my niece wants to ride a scooter but her brothers are way to dangerous. Definitely a go to company! Thanx for the chance to win one & good luck to all that entered, this is going to be a fabulous prize to win! My granddaughter would love the micro mini. At 3 years old she really needs to learn balance and coordination, she sure does fall down a lot and of course she wants one. WoW my daughter will love that! My son would love the micro black. He would love to keep up with his brother on their bike. I would like the Micro Black adult scooter as I have teens so they could use this one. I would choose the (1) Micro Maxi for my nephew to give him the confidence he needs in his every day life. He has been bullied a few times at school and i think this would really help him a lot. I feel sad and helpless for him and i would love to go for walks with him and my pet and spend some time together with this scooter that im sure he would love! I would love to win the micro maxi for my 9 year old! Im always looking for new ways to keep my kids active outside and we walk to the beach everyday in the summer and this would be perfect! It would also be perfect for our after dinner family walks!!! we would like the Micro Maxi for my grandkids. I would love to win the adult scooter in white. I would like to win the Micro Maxi. I have 8 grandchildren so any of these would be fine. 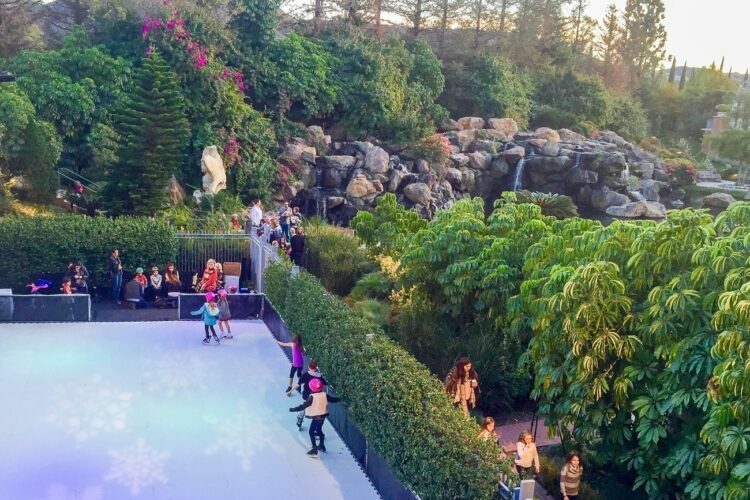 I think it is great for kids to do things outside. It’s good for them. Thanks! I would love to have the Micro Maxi for my 8 year old daughter. I think she would really enjoy it. He only has had a very small scooter when she was much younger. I would love to win the micro maxi for my kids. They will love it! A mirco Maxi…My daughter isn’t quite old enough for an adult scooter yet (although don’t tell her that) she needs that extra balance. I would most like to win the micro maxi scooter. Both of my kids love riding scooters. One of my kids will be ready for the Maxi scooter next year. I would love to give it to him for his next birthday. I think I would have fun on the adult scooter. The Micro Maxi would be the best for the kids in my family because I have kids from ages 5 up to 10 and this one would get the most use and be fun for them. Micro Black so the older kids and the adults can both share. We have never had one before. I would LOVE to win a Micro White OR Micro Black adult scooter so I could have a scooter to ride along with my 4 & 6 year old at the park, or through the neighborhood! We got our 6 year old a scooter when he was 4, and it helped tremendously with his coordination and it’s also been great exercise for our kids. I would like to win a Micro Maxi because my son’s fifth birthday is coming up and he would love this one! The Micro black would be awesome for my grandson who just moved to Florida and lives to be active and outdoors as much as possible! I would love the Micro Black scooter best. My kids have had other scooters and loved them. I like the Micro Black adult scooter for my son! I would love the Micro white Adult Scooter for my daughter. She recently outgrew hers and she would be thrilled with this. I love the exercise she gets from riding a scooter. Micro White OR Micro Black adult scooter – I would love to ride with my kids! I would love the mini2go in pink for my grandbaby. She is 2 and would love this. I would love the Micro black scooter for my son. Our apartment isn’t big enough to store a bike but the scooter is the perfect size. Thanks for the chance! I would pick the Mini2Go for my 2 year old son Ezra. He has currently a little delayed in his gross motor skills and we are working with him weekly with a OT to help get him on track to start preschool school next summer. I think this would be PERFECT for him, because he could ride and then eventually learn to stand and since the Mini2Go converts to a standing scooter, it would be perfect to grow along with him as his gross motor skills get better. I would love the adult scooter in white or black to ride with my boys. It’ll be cool to win this for my lil niece. 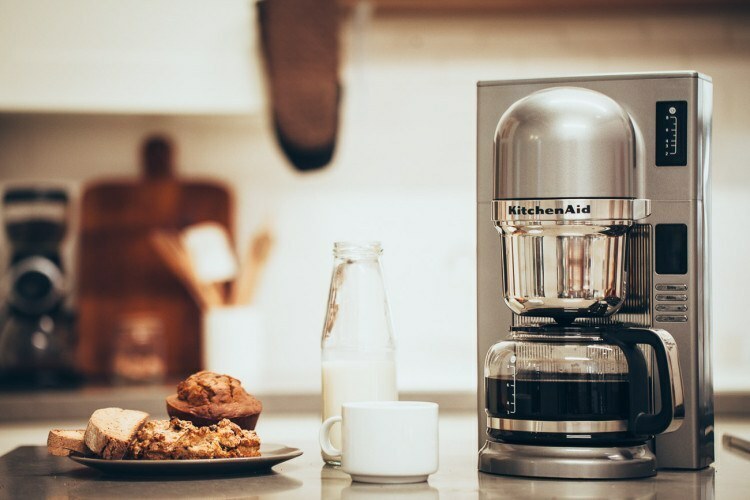 I like the micro mini…think it would be perfect for my grandchild. i would like to get the micro black adult scooter for our son. I would pick the Mini2Go for my niece. I think my 9 year old would love the Micro Maxi she enjoys playing outside and exercising. She even likes to go on hikes with my fiance and I. We have a scooter but she’s too big for it so she doesn’t ride it any more however I do feel that it has helped with her coordination. The micro mini would be great for my daughter. I am most interested in the Micro Black adult scooter because my kids are older but still would love the challenge. I’d like to win any of the scooters. I have one son who’s 7 and could use a new one and I he a baby girl who I’d eventually like to get one for. Thanks for the chance! I am most interested in winning the Micro Mini scooter for my nephew. I forgot to say why. This is the perfect size scooter for my nephew and this would be a great way to get him to stay active. I think he would benefit by learning how to balance and just being active. I would love the Micro Maxi for my daughter. I think it would be awesome for her balance skills and it would be a lot of fun for her too! I am most interested in the Micro Black adult scooter so I can get from here to there. They are all awesome.. anyone in my family would love these. My youngest son would love the Micro mini. I would love to ride the adult Micro black one.. and my daughter would absolutely love a Micro Maxi the most.. in a super girly color like pink or purple. I think these would make a great gift. I’m interested in the Micro Black adult scooter because I would like to try it out! I am most interested in the Mini2Go. It is the perfect size for my daughter’s age and it is a great starter scooter. She would love it! I would choose the mini2go, because it is the perfect size for my 3 yr old granddaughter. I would like the Micro Black Adult Scooter for our daughter. Would be fun exercise for her. I’d love to win the Mini2Go. I think it would be the best choice for my daughter. I would love the Micro Mini for my 4 year old son.